This lively introductory text exposes the student to the rewards of a rigorous study of functions of a real variable. In each chapter, informal discussions of questions that give analysis its inherent fascination are followed by precise, but not overly formal, developments of the techniques needed to make sense of them. By focusing on the unifying themes of approximation and the resolution of paradoxes that arise in the transition from the finite to the infinite, the text turns what could be a daunting cascade of definitions and theorems into a coherent and engaging progression of ideas. Acutely aware of the need for rigor, the student is much better prepared to understand what constitutes a proper mathematical proof and how to write one. 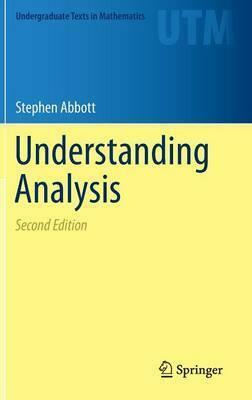 Fifteen years of classroom experience with the first edition of Understanding Analysis have solidified and refined the central narrative of the second edition. Roughly 150 new exercises join a selection of the best exercises from the first edition, and three more project-style sections have been added. Investigations of Euler's computation of (2), the Weierstrass Approximation - Theorem, and the gamma function are now among the book's cohort of seminal results serving as motivation and payoff for the beginning student to master the methods of analysis. Illustrations note 36 Illustrations, color; XII, 312 p. 36 illus. in color. Fifteen years of classroom experience with the first edition of Understanding Analysis have solidified and refined the central narrative of the second edition. Roughly 150 new exercises join a selection of the best exercises from the first edition, and three more project-style sections have been added. Investigations of Euler's computation of ζ(2), the Weierstrass Approximation Theorem, and the gamma function are now among the book's cohort of seminal results serving as motivation and payoff for the beginning student to master the methods of analysis. hat exposing students to it could well lead them to expect such excellence in all their textbooks. ... Understanding Analysis is perfectly titled; if your students read it, that's what's going to happen. ... This terrific book will become the text of choice for the single-variable introductory analysis course ... "
Preface.- 1 The Real Numbers.- 2 Sequences and Series.- 3 Basic Topology of R.- 4 Functional Limits and Continuity.- 5 The Derivative.- 6 Sequences and Series of Functions.- 7 The Riemann Integral.- 8 Additional Topics.- Bibliography.- Index. "This is a dangerous book. Understanding Analysis is so well-written and the development of the theory so well-motivated that exposing students to it could well lead them to expect such excellence in all their textbooks. ... Understanding Analysis is perfectly titled; if your students read it, that's what's going to happen. This terrific book will become the text of choice for the single-variable introductory analysis course; take a look at it next time you're preparing that class." "Each chapter begins with a discussion section and ends with an epilogue. The discussion serves to motivate the content of the chapter while the epilogue points tantalisingly to more advanced topics. ... I wish I had written this book! The development of the subject follows the tried-and-true path, but the presentation is engaging and challenging. Abbott focuses attention immediately on the topics which make analysis fascinating ... and makes them accessible to an inexperienced audience." Stephen D. Abbott is Professor of Mathematics at Middlebury College. He is a two-time winner of Middlebury's Perkins Award for Excellence in Teaching (1998, 2010). His published work includes articles in the areas of operator theory and functional analysis, the algorithmic foundations of robotics, and the intersection of science, mathematics and the humanities.